Generous chunks of our Sourdough Hard Pretzels bursting with intense flavor combinations...like the delectable honey mustard and onion in our Honey Mustard & Onion Pretzel Pieces. 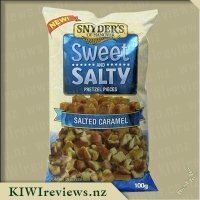 When our KIWIreviews box arrived and I unpacked it to see our goodies, I was really pleased to have received three of the Snyder&apos;s Pretzel Pieces to try as hubby was already a big fan, but they are a "only if we have enough spare at the end of shopping" kind of treat - so definitely savoured in this house. I was lucky enough to be able to open these when the rest of the family was not home - well planned on my part so I did not have to share... at first! I am on the lookout for new things that all members of the family like, and that are a little bit different - the same old boring snacks are just that - boring! First - the packaging and look of the pretzel pieces. 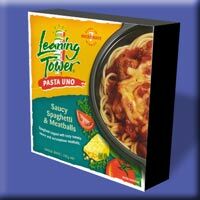 The packaging is great - bright and cheery, depicts the product really well, and has good information if you are so inclined. Opening the packet is easy - tear, and go. Being foil on the inside it helps keep the light out, and the freshness and flavour locked in. A suggestion would be to have a snap lock type closure, but without it I am not deterred from purchasing again. Looking at the pretzels - they are similar to what is depicted on the front, chunks of crunchy, flavour some goodness! The flavour is quite evident when you open the bag - the mustard smell reminding me of hot dogs! You can see the flavour which is always good - no-one likes lack of flavour on your snacks! The flavour itself is a really good combo - sweet, but tangy - not super mustardy. I did not really taste the onion, if I am honest. I offered these to my three children (testing out if the mustard flavour was evident) and they really enjoyed them too - when I asked them how they would describe the flavour, they were not too sure - they said it was a bit sweet and salty - that is the best I could get from them! Husband nailed it though - saying honey mustard. I absolutely will buy these again - these are, to date - my favourite of the flavours - so I will probably hide them to scoff them by myself! Having tried the cheddar cheese variety of these pretzel pieces I was very excited to try this variety, although I wasn&apos;t sure whether I was going to like the honey mustard and onion flavour. Honey mustard is a very popular flavouring, particularly on chicken, but I had never heard of it mixed with onion before. The packet represents the product well. The colours match well with the honey mustard and onion flavour being yellow and brown with pictures of honey, mustard seeds and onions on the bag. The packet is a foil based packet and that leads me to think the pretzels inside will be nice and fresh as we all know foil keeps things fresher! Upon opening the packet I see the familiar pretzel pieces. Certainly not uniform in shape but this adds to the rustic feel of the product. The pieces range in size from pieces about the length of my thumb, to pieces smaller than my thumb nail. I do like this however as it meant I could sample a smaller sized piece first to make sure I liked them! The pretzel had a yellow colour to it which matches the flavour, although certainly not as bright as the colouring on the cheddar cheese flavour. The first flavour I notice is that of the mustard but this is soon replaced with a little bit of sweetness and then the onion flavour. I did like this, as mustard itself isn&apos;t a flavour I enjoy so when having honey mustard for me it needs to have more focus on the honey. Wanting to challenge myself a wee bit I started thinking about what I could create with these pretzel pieces. 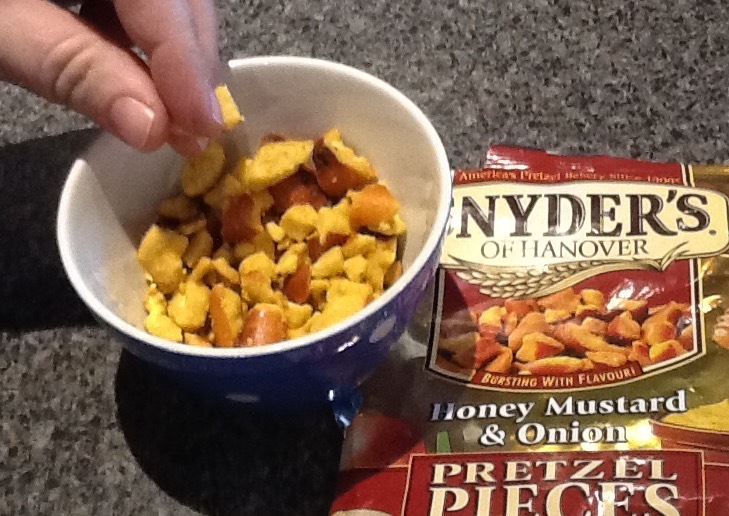 Then it came to me - honey mustard and chicken are a perfect match, so why not make some chicken pieces coated in the honey mustard pretzels. I immediately got some chicken out of the freezer to defrost for the next day. Once it was time to prepare dinner I cut the chicken breasts into four pieces and removed any excess fat. I put the remainder of the pretzel pieces into my wee stick blender container and started to blend them up. It managed to crush up a good chunk of them, but it wasn&apos;t the best way to do this. I emptied the pretzel pieces into a plastic zip lock bag and then attacked them with the wooden rolling pin, crushing them old school styles! Once they were crusted I rolled each piece of chicken in flour and dipped them in egg. I then placed them onto the pretzel pieces that I had put onto a plate. I made sure to coat each piece well before putting them in an oven dish with some baking paper. Once they were all coated I cooked them in the oven at 180 degrees until they were cooked through. I served them with a simple salad and it was a perfect meal. The chicken pieces had a very mild honey mustard and onion flavour to them, enough to taste it but not to over power the chicken. They had gone nice and crispy in the oven which was just perfect! To anyone who loves chicken and honey mustard I suggest you give this a go! 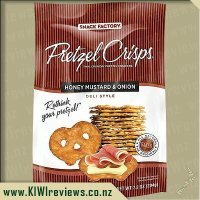 I was excited to try these Honey Mustard & Onion Pretzels for two main reasons; firstly the flavour combination and secondly the opportunity to add these to my cheese/snack board repertoire. My group of friends and I have always had a bit of a competition together trying to source the next new thing to add to our snack trays when we are entertaining and since no one has ever introduced a pretzel other than a plain old skinny salted pretzel, these Honey Mustard & Onion Pretzels might just give me the win! 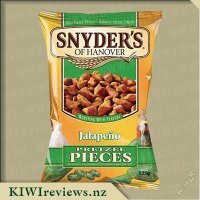 When I got the pretzels, I was impressed by the size of the packet for the recommend price which I thought gave good value for money. On the rear of the bag, I noted they were made in USA, which seemed to make them more authentic to me, the packet was easily torn open and I immediately looked inside and noticed the large broken up pieces of pretzel. The size of the pretzles were not like anything I have seen before, they were very chunky, amount finger girth and absolutely covered in a yellow flavour coating. I popped a large piece into my mouth and the pretzel was totally bursting with flavour, the mustard and onion tastes were expertly combined with honey giving it both a spicy and sweet flavour. 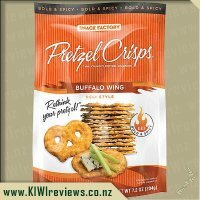 The flavour was so new that I had to have more and more pretzels to really get used to tasting them and after about half a packet I decided that they were a complete triumph and I loved them. After studying the pretzels, I can see why the makers have broken them up - this allows for the flavouring to stick to the internal sourdough of the pretzel as the outside shell of the pretzel pretty much did not have any flavour stuck to it due to the glaze on the coating. 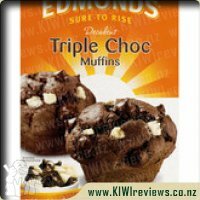 So while the broken pieces aren&apos;t pretty to look at, they are certainly tasty and I will be buying these again albeit through their website as sadly they have no distributors in my area listed on their website. Honey mustard and onion is an interesting flavour choice. A stereotypically American flavour, as it is reminiscent of the American hot dog, which is often garnished with tomato sauce, mustard, and/or onions. The real deciding factor in this flavour would come down to the strength of the mustard. The pack has a satisfying weight to it, nothing like the nearly empty potato chip packets that I find in the shops these days. For the price, you get a good amount of food. For me, heavy food is satisfying food, as I can actually feel the weight of it in my stomach, and it encourages me to stop eating. An easy to open foil packet, there is a reasonably strong smell. Nothing as in-your-face as the jalapeno variety, but definitely a rich aroma. While the smell is musty, it isn&apos;t a distinctive mustard smell, the sweetness is more prominent. The pretzel pieces have a variety of shapes as if broken by hand and not a machine. and have a clear yellow colour, which one would expect to be indicative of the mustard flavour. Biting into a pretzel piece, there is a strong initial burst of mustard flavour, that is almost like a hot English mustard, but it immediately recedes away, allowing the longer lasting onion flavour to become the focal point of the flavour and linger. The onion flavouring comes across in such away that the pretzel piece tastes somewhat like a deep-fried onion ring, dipped in a honey mustard dip. I suppose I would have named the flavour &apos;Fried Onion with Honey Mustard). 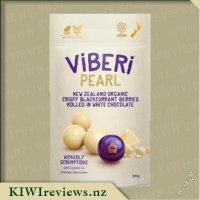 It&apos;s an enjoyable snack, that gives something different to the generic snacks that are usually available in New Zealand stores. While the mustard flavour is rather intense to begin with, the overall flavour is great, and this product is definitely something I will be keeping an eye out for. 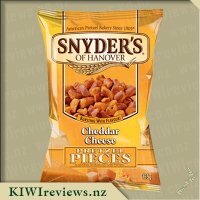 I frequently buy pretzels from the local supermarket for my kids&apos; lunches, these American pretzels made by Snyders of Hanover looked really interesting so was super keen to try them out. I thought they would be like the ones I normally get from the supermarket but these were like proper American pretzels nice chunky pieces looking more like sourdough which the product states it&apos;s made from. I wasn&apos;t too sure how the flavour combination of honey mustard and onion would be. There were a few taste testers my boss, husband, son and myself were all keen for a go. First taste everyone who was trying them wasn&apos;t too sure like if they loved them or not but man they are so more&apos;ish that once you start you can&apos;t stop and sure enough they were gone pretty quickly. The price isn&apos;t too bad I think for a snack product that&apos;s a lot more quality than the ones you get in the supermarket and that taste like a more authentic pretzel. The packaging is eye catching with its shiny gold paper and clearly shows the flavour combo you are getting. I would quite possibly buy this again as a treat for myself and would be keen to try out the other flavour combos. I would recommend anyone to give them a go. Nine of us shared this packet as I wanted to ensure I had balanced feedback. I did not expect to like the product myself as I often find honey mustard too intense; usually I prefer a plain salted version. However, I discovered that I actually liked this. 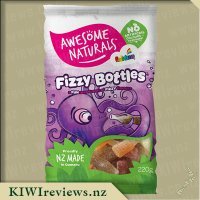 Whatever the manufacturers have done with the flavour, it works and we all liked it! 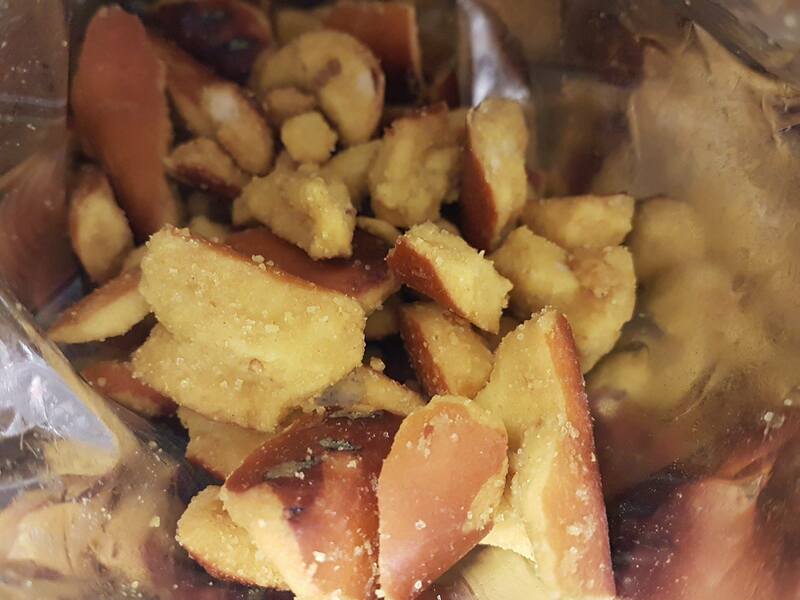 Rather than a strong sour taste, it combines a sweet and sour effect with a satisfying crunchy texture. Even though the sweet and sour flavour was predominant, the subtle onion could still be tasted. The youngest of our group enjoyed them (four of the nine testers were under eight years old) just as much as the oldest. The bag was packed with pretzel pieces, but I took care to shake out a few into an airtight container before they could all disappear as I had other uses in mind. Nice as they were just eaten straight from the bag, I liked the idea of serving them as a garnish too. One person commented that he thought they would go perfectly with more expensive nuts like cashews or macadamias as they would make them go further. Because they are quite solid, their texture would complement that of the nuts and would also add another flavour dimension. My daughter said she was pleased that they were baked rather than fried as they would be a healthier substitute for everyday potato chips. The one negative that several people mentioned was that there seemed to be a lot of smallish crumbs in the bottom of the bag. They thought a box rather than a soft bag which was prone to damage in transit might be the way to go. Next day, I was planning to serve a plain salad with dinner. I had considered sprinkling some nuts on top to jazz it up. 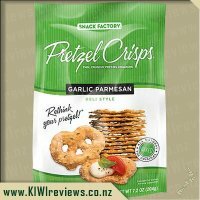 However, once I had tried these pretzel pieces, I realised that they would go very nicely instead. Sure enough, the combination worked very well indeed, even better than I had hoped. 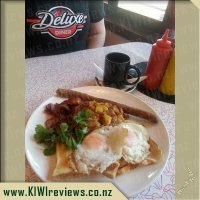 The pieces were added just before serving to ensure that they retained their crispness. I still had a few pieces left so decided to use them to top macaroni cheese, a firm favourite in my house. I always add a topping such as sesame or sunflower seeds, or a sprinkle of parmesan and paprika. The dish is then seared under the grill so that the topping browns, thus adding interest and colour. I did not brown the macaroni after adding the pretzel pieces as I thought they might catch, but since the meal was freshly cooked, the pretzels took up the heat from beneath them. And of course, as they were already nicely brown, no further grilling was needed to make them look pretty! PRETZELS!!! One of both mine and Miss 4&apos;s favourite snack foods. 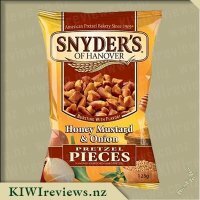 After having tried the other flavour varieties in the range of Snyder&apos;s of Hanover Pretzel Pieces I really looking forward to trying out the Honey Mustard & Onion varieties, as I was pretty sure that these would be flavoured packed and delicious like the rest of the range, and luckily I was right, these were right up there in the delicious category. 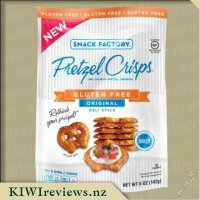 The packaging was attractive and the colours of the gold foil with the dark brown and crispy golden pretzel pieces really complemented each other and in my opinion would stand out well on the shelf, Miss 4 even commented on the "pretty, sparkly packaging". The front of the packet states that these are "bursting with flavour" and this statement is spot on, they really are bursting with flavour! The pretzels tasted amazing, and at first bite they actually tasted a lot like gherkins to me than anything else, however after a few pieces I could pick up the taste of the honey mustard flavouring and thought it was perfect not too strong and overpowering, just right, however I couldn&apos;t really taste the flavour of the onion I must admit! The texture of the sourdough worked really well as a pretzel dough as it had a must lighter texture to it than more traditional pretzels, which I liked, as sometimes I find that pretzels can make my mouth go quite dry if I eat to many. Miss 4 and I were more than happy to snack away on these, and so were a couple of friends who were visiting at the time, everyone loved them and the visitors were excited by the concept of flavoured pretzels! With only about a quarter of the packet left I decided to put them aside to use in another way other than eating straight from the packet. 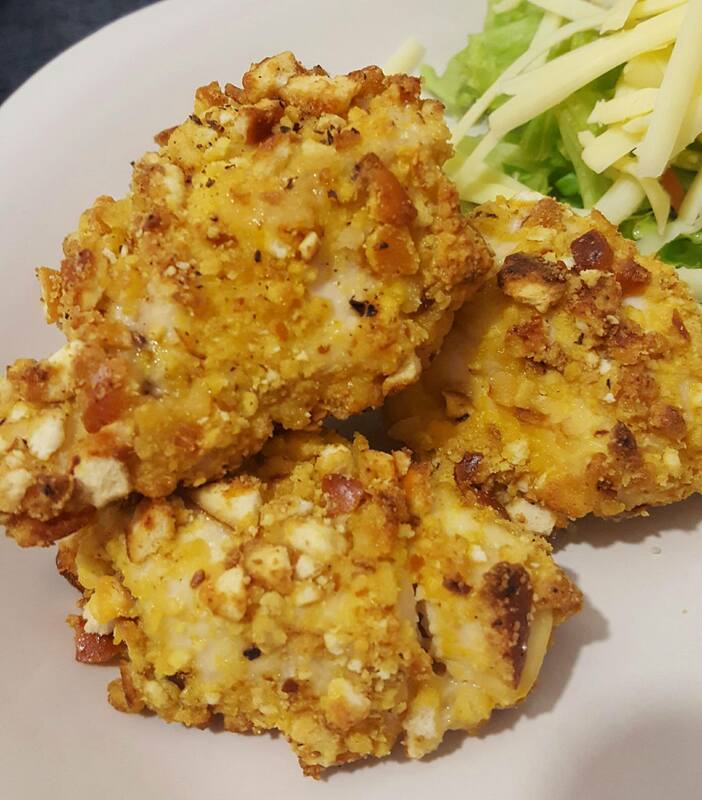 I prepared a crumbed chicken and bacon salad with lettuce, spinach leaves, cucumber, cheese and cherry tomatoes and instead of putting in gherkins and crispy noodles as I usually would do I choose to add a sprinkling of the pretzel pieces instead. These worked amazingly well in place of croutons or crispy noodles, and I would definitely by these for this purpose again, the flavour was so intense and strong that I found there was no need to add a dressing or sauce to my salad at all. Even my partner commented saying that they were really nice on the salad and he is not usually a fan of pretzels at all as he doesn&apos;t like dry foods such as crackers. If you are a pretzel lover these are well worth buying (along with the rest of the range) they make a great snack and can be used as complement to meals in so many ways, whether it be as a crumb to coat meat or as a addition to a vegetable dish or as a snack on a platter, the flavour of the honey mustard & onion is worth trying out. The pieces are infact pieces so of various different shapes and sizes, not that this bothered me in the slightest, though I think the texture of the sourdough could make for some great pretzel sticks! A delicious product which I will be buying again. We serve a wide range of traditionally prepared Indian dishes and side-dishes, and cold beverages. 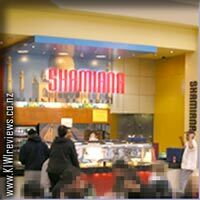 You can eat inside, in the outdoor eating area, or take the food home, depending on the site.